It is important to plan and measure carefully before placing an order since all items are custom built and cannot be returned (see our return policy). Please review our pages on planning a cabinet order, on home office design, or on planning a bookcase order. If you need even more assistance or customization options, check out our Canyon Creek cabinetry and design services program. Prices and customization options are available on the web site. To find them, click on the links in the "Products" section to the left side of the page (including Kitchen Cabinets or Custom Bookcases or other furniture). Click on the subcategories of interest and, when you find an item of interest, click on the name of the item to see the available options and order. 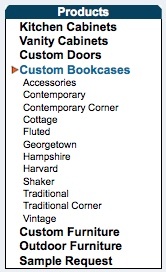 If you can't find the exact size cabinet or bookcase that you need, click on the name next largest size and then choose from the available customization options. 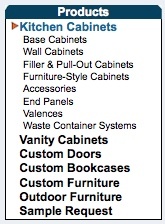 You can find accessories or furniture-style cabinets in separate sections. Wood species, door style (on cabinets), and all options listed in red require a choice. Other options listed in black can be ignored. Some options have their own price that adds to or subtracts from the base price. If you are requesting size customizations or something special, please enter it in the "customization notes" field. Enter the number of items you want and click on the "order" button to place them in your shopping cart. You can also download the 2007 catalog in PDF format. There are many new items listed that have not yet been added to the web site, but we can provide you pricing on these via email. If you are not ready to order now, register on the site (create a username and password) and create a wish list. Review the page with our shipping and delivery options. Please ensure you have submitted a valid email address or phone number so we can contact you. If you choose to pick up at a freight terminal, we will send you a list of terminals close to you. You can pay over the phone with a credit or debit card or you can use PayPal, which will keep your credit card or bank account information private (we will never see your account information). If you prefer to pay over the phone, please submit your order with a comment asking us to call you back and a convenient time to call. After you have submitted and paid for your order, we will send the order to the factory for production. 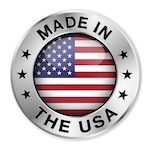 We will provide you an update via email when we find out the date your order will be ready for pickup or delivery. For more details on picking up or accepting shipments, please review our receiving and return policies.